My Grandmother—a silent film by Soviet Georgian director Kote Mikaberidze made in 1929 and banned by the Soviet regime for 40 years—is finally available on DVD. Beth Custer has coupled this amazing film with her own score (performed by the Beth Custer Ensemble and special guests). Hans Wendl produced the soundtrack. The DVD has Russian intertitles with narration in English. 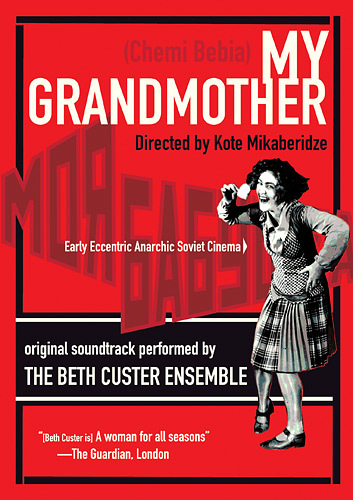 Forgotten for a half-century, Kote Mikaberidze’s MY GRANDMOTHER is a delightful example of the Soviet Eccentric Cinema movement as well as an irreverent satire of the then still-young Soviet State system. Noted for its anarchic styles—which include stop-motion, puppetry, exaggerated camera angles, animation and constructivist sets—the film unspools the foibles and follies that abound when a Georgian paper pusher, modeled after American silent comic Harold Lloyd, loses his job. Beth Custer created a quick-paced pastiche of American jazz and blues, contemporary classical, and world folk music. Check out this amazing film!